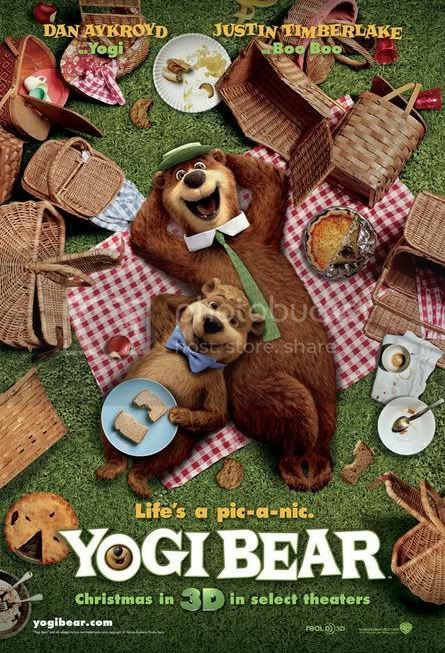 One might think that a big screen adaptation of Yogi Bear might be ill-fated, and they would not necessarily be wrong. There is not much about the film that excels, but it is mostly inoffensive and has enough slapstick to keep very young audiences entertained. Tom Cavanagh is Ranger Smith, a nature lover in charge of Jellystone Park. He has lived there much of his life, but the park has never been in this much danger. The mayor (Andrew Daly) of the town (which apparently owns the park; maybe it is not Jellystone National Park?) is in dire straits, having spent the town’s budget on fancy suits and other excesses. With his right hand man (Nathan Corddry) he is intent on finding new sources of revenue. The most obvious is re-zoning Jellystone so he can auction off lumber rights to the highest bidder. This entry was posted in 1 pirate flag, 2 stars, Movie Reviews, Pirate Flag Rating, Star Rating, Y on March 9, 2011 by Tim Irwin. 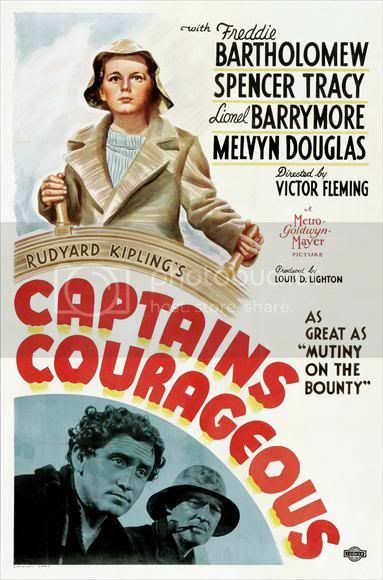 Captains Courageous is a film like many others, whose popularity decreased after perhaps the late 1950’s, when cliches had become so rooted in film culture that the only way to move an audience was to shock them, mildly at first then rather strongly as the 1960’s gave way to the 1970’s. But Captains Courageous is a gentle reminder that there used to be a different kind of movie, one that told a solid story with interesting characters. Some of it may be dated now, and some of it may be cliche today, but it still works, and rather well at that. 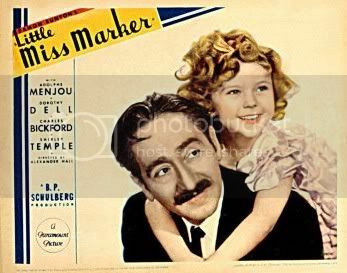 The first half hour of the film is occupied with the setup of Harvey Cheyne’s (Freddie Bartholonew) life. He is a young boy, and his father (Melvyn Douglas) is fabulously wealthy. A tower in downtown New York City has the Cheyne name on it. Harvey’s mother died some years past, and his father does the best he can. His best, unfortunately, is not very good, as he caters to Harvey’s every whim. Or, if he’s not present to cater to each whim personally (which he often isn’t) there are numerous servants ordered to dote on him. This entry was posted in 1 pirate flag, 1937, 3 stars, C, Movie Reviews, Pirate Flag Rating, Star Rating, Year on February 4, 2011 by Tim Irwin. 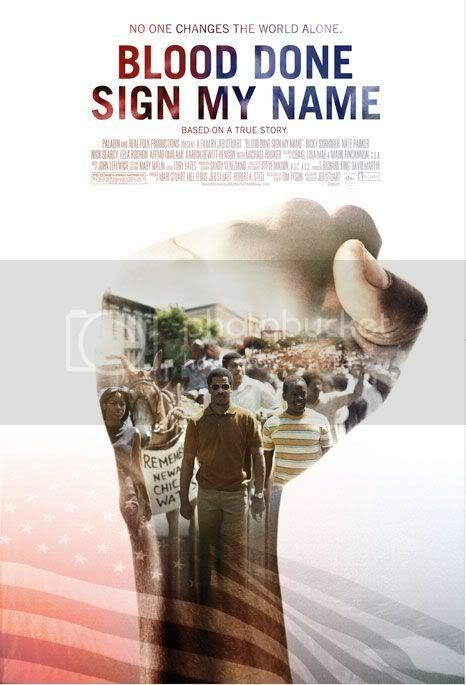 Blood Done Sign My Name is a good example of a film that lets the historical account of its story get in the way of the film. In its attempt to be accurate it loses its heart, even going so far as to allow documentary style footage to invade the beginning and end of the film. This is unfortunate, because the story is interesting and worthy of an accurate and engaging portrayal. Bizarre documentary-like interviews open the film, as people recall the events of 1970 in a town called Oxford, in North Carolina. It isn’t clear, particularly when similar interviews appear at the end of the film, if these are people who lived through those events or if they are actors pretending that they did. After this short and bizarre sequence the actual film begins. This entry was posted in 1 pirate flag, 2 stars, B, Movie Reviews, Pirate Flag Rating, Star Rating on October 15, 2010 by Tim Irwin. 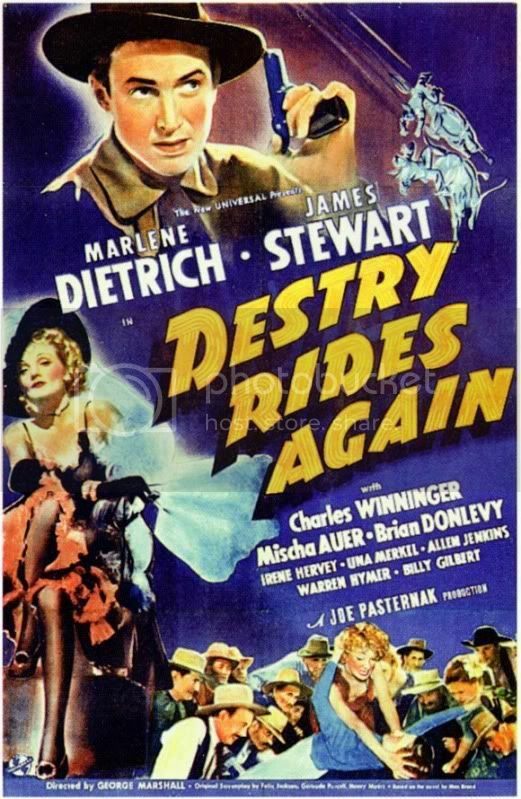 Destry Rides Again isn’t a typical Western, in many respects. Destry himself is a non-violent pansy for much of the movie, in a move that I can applaud the filmmakers for attempting. With Jimmy Stewart occupying a lead role alongside Marlene Dietrich, the film becomes a near-classic, held up by only a few flaws. The story is nothing terribly original for a Western, though in late 1930’s America it probably hadn’t been tried too many times before (discounting the 1932 version of the book). Some inconsistent tones hurt the film toward the end, but with a strong cast and a competent production, Destry Rides Again is worth watching, if only to see an early iteration of Jimmy Stewart’s Elwood P. Dowd from Harvey. This entry was posted in 1 pirate flag, 3 stars, D, Movie Reviews, Pirate Flag Rating, Star Rating on October 10, 2010 by Tim Irwin. There’s hardly been a cuter child star than Shirley Temple. Henry Thomas in E.T. : The Extra-Terrestrial [review here] is perhaps close, and closer still is Ronny Howard in The Courtship of Eddie’s Father. But Shirley Temple lights up the screen every time she appears, regardless of how many times she glances off camera to look for direction. In short shots she is radiant, practically the best part of Little Miss Marker. This entry was posted in 1 pirate flag, 3 stars, L, Movie Reviews, Pirate Flag Rating, Star Rating on October 8, 2010 by Tim Irwin. Sliding Doors is a bit of a different romantic comedy, in a couple of ways. To begin with, it adds a slight supernatural or science fiction gimmick to its plot, though this has been done before (and more proficiently, in Brad Anderson’s Happy Accidents). Secondly, it is remarkably tragic in a number of ways, and is surprisingly light on the comedic aspect of the genre. There are a number of cute moments, some humor, and some interesting plot devices, but Sliding Doors ultimately cannot follow through on its more lofty goals of being a cerebral rom-com. Gwyneth Paltrow is cute and tiny as Helen. Her job is PR, in London, and on one fateful day her world is split in two, almost literally. After leaving the flat she shares with her boyfriend, aspiring author Gerry (John Lynch), she arrives late for work and discovers she has been sacked for stealing bottles of vodka (Smirnoff; it shouldn’t be surprising that the brand responsible for changing the fundamental nature of martinis with the help of Bond films has managed to pop up here). Dejected she leaves work, bumping into James (The Mummy’s John Hannah, here less amusing and slapsticky) in the elevator. Arriving at the train station she finds herself running late, and the doors close before she gets there. This entry was posted in 1 pirate flag, 2 stars, Movie Reviews, Pirate Flag Rating, S, Star Rating on September 26, 2010 by Tim Irwin. 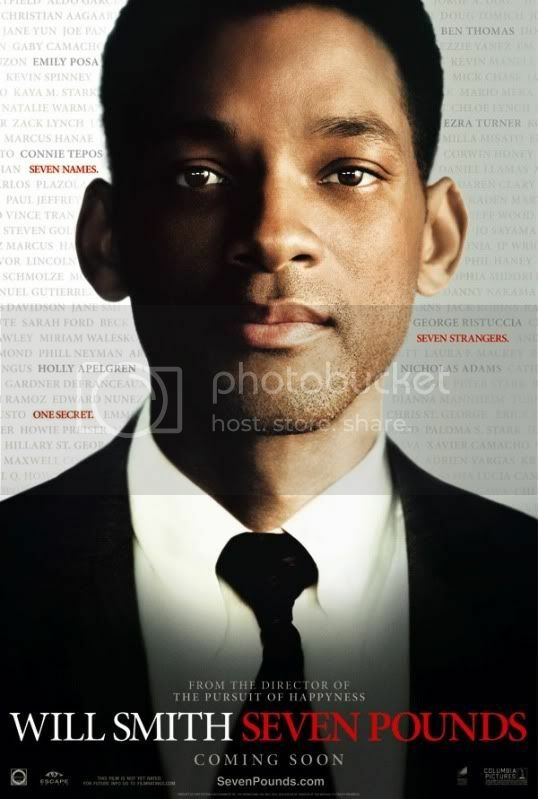 Seven Pounds is a bit of a confused and broken movie. It starts out deliberately so, with flashbacks and a foggy exposition. By the time things start making sense the story becomes less interesting and it is increasingly difficult to empathize with any of the primary characters. There is one main character, Ben Thomas (Will Smith). At the beginning of the film he is making a phone call to 911, informing them that there has been a suicide and they need to send an ambulance. “Whose suicide?” They ask. “Mine,” he replies. At this point the movie starts jumping around chronologically. It is, at first, difficult to tell what scenes are in the present as the movie takes no pains to explain anything. Eventually the narrative calms down and it becomes clear that certain scenes are flashbacks, though by this time any mystery has been eliminated. This entry was posted in 1 pirate flag, 2 stars, Movie Reviews, Pirate Flag Rating, S, Star Rating on May 22, 2010 by Tim Irwin. Women, for a long time, had to suffer heartily in the movies. They were expected to be housewives and mates (and potential mates). In 1940 Rosalind Russell was a powerful reporter in His Girl Friday [review here], and then Katherine Hepburn took the reins. Nowadays women are required to work in films, and are usually empowered. But so often they rotate between one of three professions: writer, journalist, or fashion industry worker. 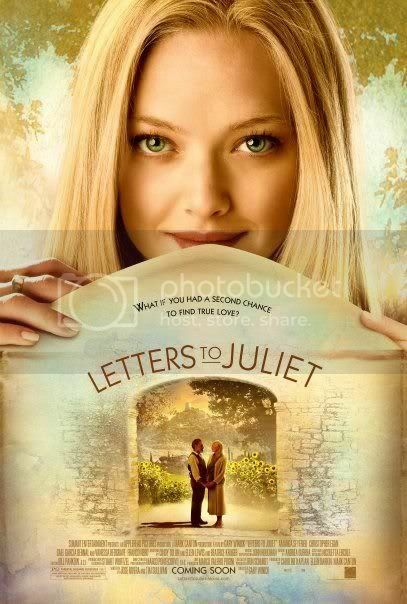 Sophie (Amanda Seyfried) is a writer, or at least wants to be one. The film opens with a montage of her as a fact checker; she verifies information in other people’s articles before they run. She works for The New Yorker and is very thorough. Her boss (Oliver Platt, in a brief bookending cameo) wants her to stay on as a fact-checker, not wishing to give her the opportunity to expand into writing. This entry was posted in 1 pirate flag, 2.5 stars, L, Movie Reviews, Pirate Flag Rating, Star Rating on May 14, 2010 by Tim Irwin. Marty is often labeled among the least deserving Best Picture winners, and rightly so. Ernest Borgnine’s acting is sufficient but somewhat overstated; Marlon Brando’s explosive method acting, seen earlier in the decade in films like On the Waterfront, rendered Borgnine’s attempts archaic and forced. The melodramatic story moves slowly and ploddingly, making the belabored themes all the more difficult to swallow. Despite its obvious flaws, Marty is not a bad film. There are a number of sweet moments, most of them revolving around Marty’s character. 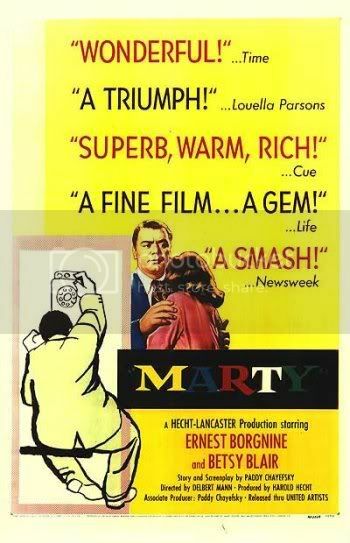 Marty (Borgnine) is a good-natured, chivalrous gentleman, the last unmarried child of Mrs. Pilleti (Esther MInciotti). He is 34, works as a butcher, and is rather large and ugly. He’d be the first to admit it; even his father was ugly. He has trouble with the girls. His friends keep using him to keep the “squirrels” they pick up happy. They use him to score with their own tomatoes, the ones they continually attempt to pick up at the Stardust Ballroom. This entry was posted in 1 pirate flag, 2.5 stars, M, Movie Reviews, Pirate Flag Rating, Star Rating on April 3, 2010 by Tim Irwin. One might be forgiven for not having heard of Gargoyles, and their ignorance would be understandable. Gargoyles is a made-for-TV movie, not a category that I will generally review. But in this case Stan Winston is responsible for the gargoyle makeup, and it is certainly interesting to see where a legend got his start. And, while the film is not particularly good, it is a mere 74 minutes long. One of the most interesting parts of the film is the opening credits, which look like they belong in a Simpsons Halloween special, made of goofy, gooey green letters. Unfortunately, most of the rest of the film is dreadful. The movie starts with a girl getting off a plane. Her outfit is strange, with a bikini-like top thing similar to what it looks like when you take the middle of the bottom of your shirt and tuck it into the neck so as to pretend that it’s a bikini. It just seems a bit odd, and it is a bad sign when one of the film’s most memorable moments has to do with a strange wardrobe choice. This entry was posted in 1 pirate flag, 2 stars, G, Movie Reviews, Pirate Flag Rating, Star Rating on February 16, 2010 by Tim Irwin.